The centre makes available a large Photographic Display of 40 panels of Mahatma Gandhi and other accompanying materials for loan to universities or responsible civic or school groups for exhibit. Also available is an attractive set of exhibition materials on Mahatma Gandhi which are easy to display on loan from the centre. 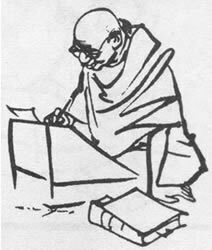 The centre also administers a ten month correspondence course on Mahatma Gandhi's life and thought. The foundation is set up to educate the beneficiaries selected by the Foundation (12 year-old upwards, those are of scarce economic resources) integrally, the teachings of Gandhi philosophy so that they are reflected in them and acquire a true commitment of service in pro of the progress and well-being of the Colombians. The mission of the foundation is to share the teachings of Gandhi, to promote and to sponsor the formation and integral professionalization of young with capacity of leadership and sense of social service, so that they revert their knowledge to the progress and well-being of the Colombians. The aim of the foundation is to structure a documentation center MAHATMA GANDHI and to share their teachings with those who are interested in knowing them, to contribute to the formation of leaders with sense of social service, to select those who are of scarce economic resources that possess capacity of leadership and sense of social service and to motivate the solidarity with the foundation. Carrera 52 No.35-33 Medellin, Colombia. The Mahatma Gandhi Center for Global Nonviolence was established in 2005. It explores the significance for the contemporary world of the great task Mahatma Gandhi set for himself and for all of us as an experiment and an actual experience. "My mission," he said, "is to convert . . . the world to non-violence for regulating mutual relations, whether political, economic, social, or religious." Through education, international dialogues, and youth-focused programs, the Center studies and supports appropriate ways to put into practice the expression of mutual respect among human beings and for the planet's natural environment. The Center is a non-partisan and non-sectarian enterprise that welcomes both secular and faith-based participants in its programs. Its goal is to serve as a synergistic center for conflict resolution and peace-building that works for the mutual betterment of all inhabitants of our planet.